In typography, TYPEFACES are often referred to as FONTS, although this is not entirely accurate. 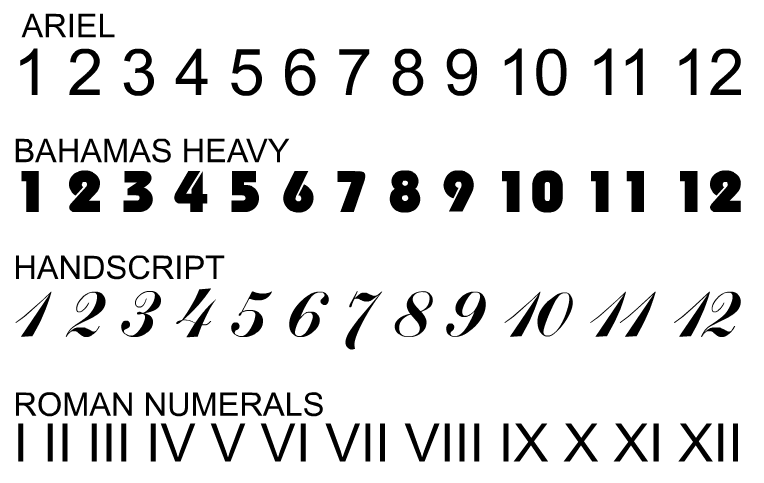 A typeface includes letters, numbers, symbols and punctuation marks. The term typeface refers to the type of lettering selected such as ‘ARIEL’. A typeface is selected very carefully and this often depends on the product and the potential customer. For instance, a road sign needs to be easy to read at a distance and at a glance, when driving. Consequently, the typeface ‘Transport Medium’ is used for traffic signs in the UK. Study the four typefaces below. Which one is the most suitable for a child’s learning clock? In your opinion, why is your selected typeface the most suitable? Which typeface is the least suitable for a child’s learning clock? In your opinion, why is your selected typeface the least suitable?